When you are finally visiting one of the most exciting cities in the world, it is a downright must to stay in one of the most convenient and comfortable accommodation options you can find. There are so many possibilities available really when choosing the best Bangkok city hotel, but we would like to guide through the variety with a few pointers on what you might want to look for. A Bangkok city hotel first of all absolutely must be convenient. This is a comment on its location of course. Not only do you not want to be staying so far from the action that you may as well admit you are in the suburbs rather than the actual capital of the amazing country called Thailand, but you also need to have easy access to everywhere you wish to go, and an easy trip back to your hotel from sightseeing trips. Consider for example how VIE Hotel Bangkok, MGallery by Sofitel is just a few steps from one of the BTS Skytrain stations. That’s the kind of transportation you need in this massive city as infamous for its traffic jams as it is famous for its temples, shopping and nightlife. A central location is also a must. Afterall, you might just want to explore a bit of this fascinating city on foot. All of the most well known shopping centers are just ten minutes walk away, and that is exactly what you need in a Bangkok city hotel. Have you considered the facilities you will desire during your stay? Delicious food is up everyone’s alley, but in choosing a Bangkok city hotel, why not select one that absorbs the influences of a steady program of visiting Michelin-starred chefs? Now that’s something to sink your teeth into. 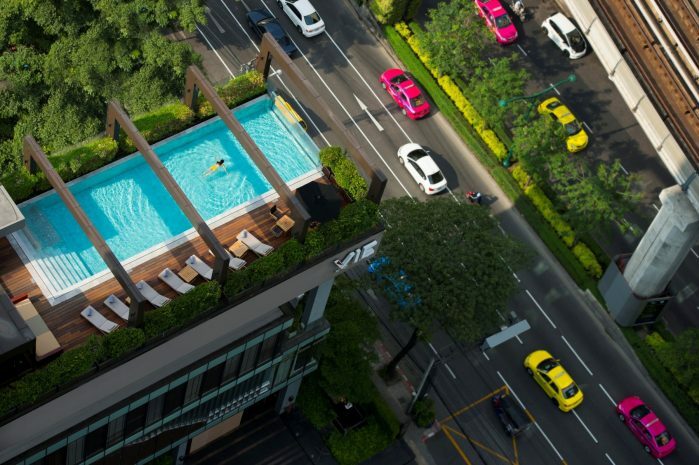 A rooftop pool is also a fine addition to your holiday, just like at VIE Hotel Bangkok.